Because workplace conditions can change daily, inspection becomes very important in order to maintain an established safety effort. FIRE, jolts, arcs, thermal burns, flash burns . . . . There are few workplace scenarios as potentially deadly as those that involve work with electricity or electrical items. Yet we all have a tendency to overlook the most basic of hazards in the workplace, too. Normal wear and tear of a busy production line, abuse from hurried or disgruntled employees, ignorance, or apathy can spell disaster for unattended electrical safety on many job sites. From upscale office space to the muddiest of construction sites, consistently safe electrical use and the need for constant safety awareness touches almost every workplace daily. Few employees have the knowledge (or interest) to understand the electrical code. This is all the reason you need to make your electrical safety training program simple, reasonable, and straightforward. There is no way to cover all necessary topics at one time, so pick those items most needed for your employees. Also, provide training in some form on a regular basis--which can include video, discussions or toolbox talks, handouts with the employees' paycheck, or even structured classroom time. One place to start is OSHA's Electrical Safety and Health Topics page (www.osha.gov/SLTC/electrical/index.html). Other worthwhile resources to help you develop your training presentations include the Electrical Safety Foundation International (www.electrical-safety.org), Underwriters Laboratories Inc. (www.ul.com), and the editorial archives of Electrical Contractor magazine (www.ecmag.com) and EC&M magazine (www.ecmweb.com). How much each employee knows about electrical safety may depend on his or her job duties. Because workplace conditions can change daily (such as the addition of an unapproved electrical item purchased at a yard sale, running a cord through a wall, etc. ), inspection becomes very important in order to maintain an established safety effort. As part of your facility's monthly (or more frequent) safety inspection, have different employees look for violations after instructing all of them about what to inspect for. Make inspections everyone's responsibility, too, in order to have a complete effort by employees. Put into place associated policies that support electrical safety, including (but not limited to) these: No unapproved personal electrical appliances or devices are allowed that have not been inspected for leaks or damage; No space heaters may be used; Report damaged cords or items immediately; etc. And if your workplace has electrical hazard potential, improve your first aid kit to accommodate possible injuries requiring attention. Direct contact with the electrical energy. Often, the injured parties describe this as a jingle, tingle, or jolt. At times employees do not take this seriously because the pain may be minor, so no action is taken. After the injury, several employees may comment, "Yeah, that one has had a short in it for months" or "It shocked me last week, too!" Electrical arcs (jumps) to a person who is grounded (providing an alternative route to the ground for the electricity). Thermal burns, including flash burns from heat generated by an electric arc and flame burns from materials that catch on fire from heating or ignition by electrical currents. These can range up to fatal injuries, depending on the situation. Muscle contractions, or a startling reaction, can cause a person to fall from a ladder (for example). The fall can cause serious injuries, especially back and head injuries. No electrically related injury should be ignored or regarded as "minor." The next injury with the same frayed cord or other similar situation may cause serious or life-threatening injuries. For example, the next person who is handling that frayed cord may have wet hands . . . .
Are regular job site inspections conducted on at least a monthly basis and documented? Do employees understand that all breaker panels are to be kept clear and unobstructed? Are all breakers and fuse boxes clearly and completely labeled? Each switch should be positively identified as to which outlet or appliance it is for. Is office equipment manufactured with grounded plugs (three-prong plugs) used in accordance with the manufacturer's instructions? Is the third (grounding) prong never removed from any three-prong piece of equipment? Are items where the third prong is removed reported by employees for repair and removed from service? Are cracked, frayed, or broken electrical cords promptly disconnected and replaced? Are extension cords kept clear of doorways and other areas where they can be stepped on or otherwise damaged? Have employees been instructed that extension cords are never plugged one into another or fastened with staples, hung from nails, or suspended by wire? Are all worn or frayed cords and cables removed from service and labeled "do not use"? Are items removed from service destroyed or otherwise tagged out of use--not simply discarded or given to employees to take home? Do you ensure that cords are not pulled or dragged over nails, hooks, or other sharp objects that may cause abrasions in the insulation? 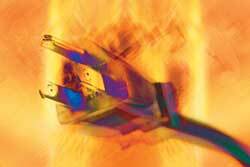 Are cords never wrapped tightly or folded, in order to prevent damage to internal wiring? Are cords never placed on radiators, steam pipes, walls, windows, or under carpets or rugs? Furniture must not be placed over cords. Do you ensure electrical machines are disconnected before cleaning, adjusting, or applying flammable solutions? Are lockout/tagout and assured grounding programs in place if required and needed? Are employees instructed to inspect tools, power cords, and electrical fittings for damage or wear prior to each use? Do personnel always use ladders made of non-conductive materials when working with or near electricity or power lines? Do employees know where the breakers and boxes are located in case of an emergency and have keys if needed for access? Do employees know to pull the plug, not the cord, when disconnecting electrical items? Do you ensure they do not disconnect power supply by snapping or jerking the cord from the outlet (such as when the outlet is under a table or in a hard-to-reach location)? Pulling the cord causes wear and may cause a shock. Are multi-outlet strips not plugged into other multi-outlet strips ("daisy" chained)? Are multi-outlet strips used as intended? Are space heaters, microwave ovens, and other high-current devices plugged directly into wall receptacles and not into strips or extension cords?